A quick and healthy breakfast to give your morning a big boost! Simply mix together matcha and yogurt, and top with your favorite tropical fruits. Whisk the match powder into the yogurt. 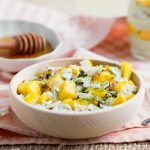 Top with mangoes and coconut flakes. Gently dust with additional matcha powder. Add other toppings, as desired. *This recipe also works well with vanilla or honey flavored yogurt. Get this recipe for Tropical Matcha Yogurt at https://www.theworktop.com/breakfast-brunch-recipes/tropical-matcha-yogurt/.